Purpose: Use thisdocument as a reference for entering a corporate payment in ctcLink. Enter or select the Business Unit and the Cashier’s Office. 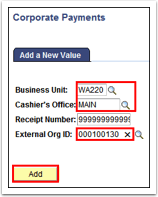 Do not alter the Receipt Number– allow this to auto-fill. Enter or select the External Org ID. In the Target Detail section, enter or select the Target i.e. Cash, Check. Enter or select the Term (optional). 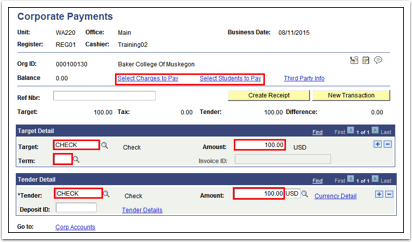 Enter the type of payment again in Tender Detail and enter additional information on the Check Information page if required by institutional policy. 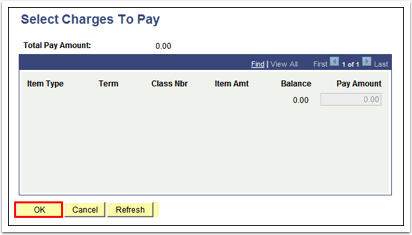 Click the Select Charges to Pay or Select Students to Pay link if required. 6a. Select Students to Pay: Enter the Student ID and Term then click OK. Click the (+) to add additional students. 6b. Select Charges to Pay: Select the items to pay then click OK. In this example, there are no charges. Click the Create Receipt button. The receipt displays in a new window. The Create Receipt button becomes the Print Receipt button. Click Print Receipt if a paper receipt is required. Click New Transaction to enter another payment.